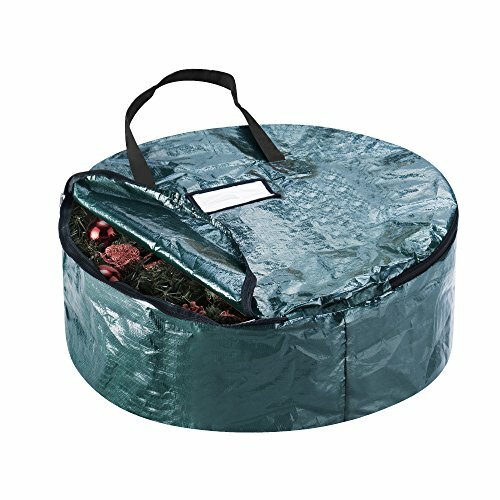 TEAR-PROOF- Made from strong, durable and tear-proof material, your tree and wreath will be protected year after year with this convenient storage bag. STANDARD SIZE- Large enough to hold a 30" diameter artificial Christmas Wreath or the right size for standard artificial door wreaths for any occasion. PROTECTIVE: Built to last year after year and protect your Holiday Wreaths from dust, mildew and rodents. CONVENIENT- Flip-top style opening allows you to set the wreath inside with ease and zip closed for storage. Product Details - Dimensions 30" x 30" x 10". Hand wash with warm water and cloth. If you have any questions about this product by Elf Stor, contact us by completing and submitting the form below. If you are looking for a specif part number, please include it with your message.